A significant proportion of rescued wild animals tend to be baby animals that are either orphaned or have been permanently separated from their parents. Most of these baby animals come in weakened conditions simply due to the delay in reaching help and being cared for, and they often do not have any major physical ailments. Although we always attempt to reunite all healthy babies with their parents, babies that cannot be reunited are hand-raised and then released at an appropriate time. Hand-raising is a dedicated set of knowledge and skills within rehabilitation that exclusively involves the care and rearing of infant animals. In principle, it covers the period from an animal’s birth to the day it is weaned and gains sufficient independence to feed by itself and attend to its basic needs like feeding, grooming, etc. This is the most delicate stage in an animal’s life simply because it is young, helpless and completely dependent upon You – the foster parent, for meeting all its requirements – security, warmth, nutrition, growth and overall development and wellbeing. Hand-raising is not only the science of rearing orphaned and displaced animals but is often the method of choice for breeding programmes, esp. in the case of highly endangered species, and is done with the aim of increasing breeding success. In the latter case, young animals are picked up either at birth or before hatching to increase their chances of survival and hence boost the existing population of the species. This also increases the chance of the parents birthing a second litter or laying a second clutch of eggs, potentially doubling the number of offspring raised in one breeding season. While hand-raising some of the offspring of species with low fecundity maximizes the survival of all offspring that are born. Let’s revisit the Magic Formula we saw on the page for the Care of Rescued Animals. I am going to modify and redefine the formula in terms of baby animals. One of the main reasons why hand-raising baby animals is such a time consuming process is because they have to be fed at frequent intervals. In addition to requiring an easily digestible and nutritious formula, specialized feeders like milk bottles, syringes, forceps, etc. – appropriate for the age, size and species in concern are also required. Any feeding equipment used MUST be sterilized after every feed. Please refer to our pages on Nutritional basics and Examples of feeders for more information. 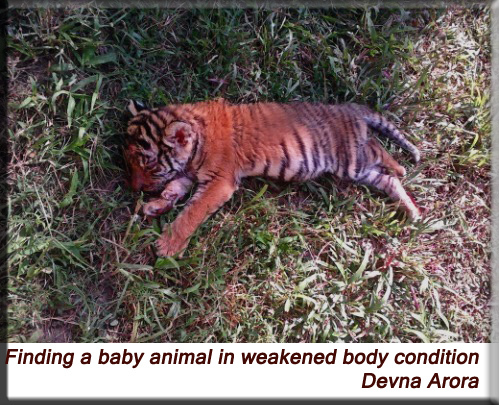 Baby animals aren’t capable of thermoregulation for at least the first couple of weeks of their lives. Simply put, they lack the ability to generate or retain body heat – this is crucial for their very survival and has to be done for them through external means. If babies are not warm enough, their entire body begins to drop and all of their reflexes, including feeding, begin to cease. Blankets or warm bedding alone is inadequate in providing warmth. The function of a blanket is to form an insulating layer and trap body heat and hence keep us warm. Since baby animals are incapable of generating body heat, blankets alone are ineffective unless external heat is provided. In nature, the parents stay close to the babies until they are able to keep warm in the local environmental conditions. Babies stay warm due to the heat generated by the parent’s body. 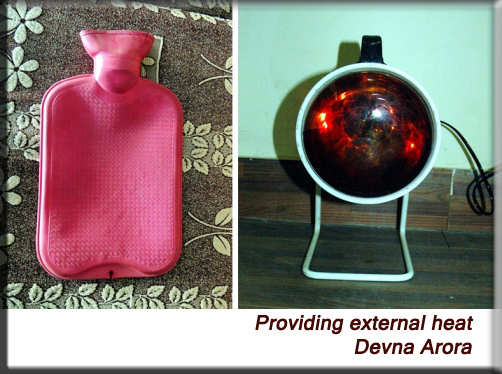 When using artificial means of providing warmth, we do this with the use of hot-water bottles, heating pads, heating lamps, incubators, etc. or by means of central heating. Whichever method used, the baby must be warm and cozy. N.B. External heat has to be carefully regulated as excessive heat will not only make the baby uncomfortable but also dangerously dehydrate it. As the baby grows and is capable of thermoregulation, external heat is gradually withdrawn. Its fur, or feathers, will also grow and thicken as the baby matures – this provides a layer of insulation and protects the animal from the cold. Housing infants is fairly easy – they are all housed indoors in the initial stages of their life. They are only shifted to outdoor enclosures once they are mobile. While security includes both a physical and emotional state of mind, we have a stronger emotional consideration in the case of baby animals – this is primarily associated with foster care. In nature, baby animals stay closely huddled to their parents and other siblings. Although this may primarily be for warmth, it also signifies emotional security for the babies. Young babies instinctively respond to touch and human touch can be vital for a young animal’s development. In the absence of the mother or other conspecifics, it is important for the caregiver to spend a lot of time simply sitting beside, or in the case of young mammals, holding or petting the young animals. Stroking the animal in a manner simulating the mother’s licks is especially reassuring for the young and they respond a lot faster. Touch may be withdrawn at the time of weaning as the animal’s need for maternal touch too decreases by this time. In my experience, young animals that have grown with adequate proximity to a single and consistent caregiver are happier, healthier, bold, put on better weight and shift onto the rehabilitation programmes sooner. In the case of wild animals, we always endeavor to prevent excessive contact and thereby prevent inappropriate imprinting and habituation. Giving the baby animal a stuffed toy (esp. if they are a little older) often satisfies this need as many babies respond positively to toys, often clinging to them, sleeping next to them and even running to them for security. Baby animals have underdeveloped and extremely sensitive immune systems. They are special care in terms of hygiene and cleanliness. In addition to the usual hygiene practices, baby animals require sterilized feeders and aseptic housing conditions. While new born mammal babies need to be stimulated to eliminate bodily waste, older babies often defecate in or around their bedding, requiring the bedding to be changed frequently. Since their diets contain a higher proportion of moisture, baby animals also pee excessively – you must ensure their bedding is warm and dry at all times. Once older, they will move away from bedding to relieve themselves and the frequency of cleaning will reduce. Enrichment at this stage simply signifies appropriate housing conditions that allow the babies to hide or burrow depending on their natural nesting habits. Baby animals all require extremely attentive and gentle handling and committing to their care requires tremendous amounts of both time and dedication. Nothing can replace the amount of time and care required by an infant and lack of the same will only result in an unfit individual that won’t qualify for release – defeating the whole purpose of the exercise. The secret to being a successful rehabilitator primarily lies in your ability to consistently provide timely care for the animal! Wild animal babies must also never be handled by too many people. In nature, babies are rarely exposed to animals other than the primary caregivers until they are a little older. They need consistency is being able to identify a caregiver – it enhances a feeling of security. Excessive handling of babies by too many people often makes them unsettled and insecure. 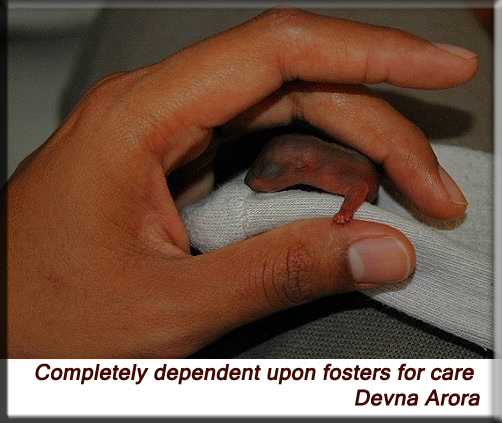 If you cannot commit to the complete care of a baby wild animal, you must never take on the responsibility in the first place but instead shift the young one to another rehabilitator at the earliest. 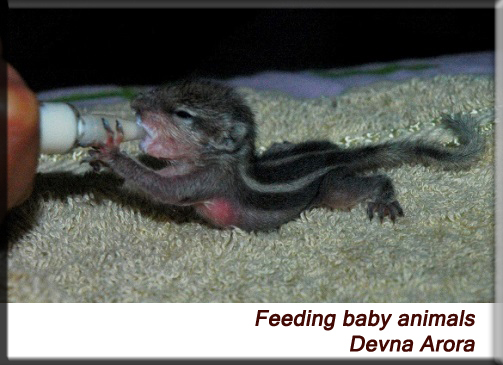 Please refer to our pages on Orphaned Animals, Care and Housing for more information.